Plot: Senior Paul Wagoner walks into his school with a stolen gun, he threatens his girlfriend, Emily Beam, and then takes his own life. Soon after, angry and guilt-ridden Emily is sent to a boarding school in Amherst, Massachusetts, where two quirky fellow students and the spirit of Emily Dickinson offer helping hands. But it is up to Emily Beam to heal her own damaged self, to find the good behind the bad, hope inside the despair, and springtime under the snow. Opinion: As a book reviewer, I have a list of books that have been sent to me by the author or a publishing house AS WELL AS a HUGE (and I mean ginormous people) stack of books that I have already purchased on my own or plan to. 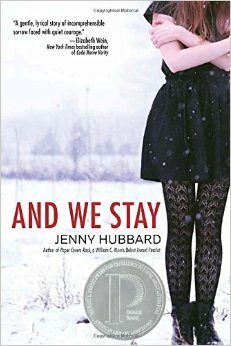 And We Stay was one of the books that I purchased on my own, and I wasn’t entirely sure I would enjoy it. I always read reviews before I purchase anything (which is probably what lead me to reviewing) and I was getting a lot of mixed feedback about this book. Some reviews praised the beautiful writing and poetry, while others expressed disappointment for a book that they couldn’t even finish. For someone who has a weird fascination with books on suicide, I decided to go ahead and buy this book. After FINISHING the book, I have concluded that I LIKE this book but I don’t love it. This is probably the only book I won’t be giving an extended plot summary for, because frankly I feel that it is already very straightforward. I will be honest, I was expecting more out of this book, and it is probably only because it was given an award (OH, the irony). I have been having a hell of a time writing this review, typing and deleting. Typing and deleting. So I am just going to start with my favorite topic, CHARACTER DEVELOPMENT. *sigh*…I feel like a broken record for saying this in so many reviews, but it’s a big part of a book! I think that is the biggest aspect of this story that is lacking, the fact that I don’t emotionally feel for Emily’s tragedy and her sorrow. I can understand it and grasp the sadness, but I don’t feel anything for her. I read while she put her grief into her poems and saw how her memories made her feel, but even that doesn’t seem very realistic to me. The memories of Paul did not do his character justice either, that would have been a great time to show the reader exactly what kind of person he was. I felt like I got bits and pieces of him, but not enough to build my own idea of him. I wanted to see the creative writing aspect in this story more as well. The poems were beautiful and haunting all in their own, but I think more description in the emotions Emily felt would have been positive. For example: how Paul killing himself could have made Emily feel as if her heart had exploded into so much tainted blood that it overflowed from inside her body and started bleeding from her eyes (over the top I know…but you get it). Where is the overwhelming description of her pain and guilt?! If I was Emily Beam and had experienced something so tragic at that age, I would have been a mess. Next Post The Beautiful Blogger and Blogger Recognition Awards! I usually have a problem with the endings. I don’t like it when a novel does not have a proper resolution, or it ends during climax. Great review! I’ve had this book on my TBR shelf for almost a year! I need to get to it.